The Amy Poehler–produced Broad City brings a unique brand of humor to Comedy Central. Photo: Linda Kallerus Broad City airs Wednesdays at 9:30pm on Comedy Central. Premieres Wednesday, January 22 at 9:30pm on Comedy Central. When Amy Poehler tells you something's funny, it's a good idea to pay attention. So when a guest appearance on Upright Citizens Brigade alumnae Abbi Jacobson and Ilana Glazer's web series turned into Poehler serving as producer on its adaptation to television, it was a sign that these young women were worth watching. Broad City follows Abbi and Ilana (Jacobson and Glazer, obviously), a pair of twenty-somethings living in New York City and struggling to live it up on their meager wages. Abbi, the more practical of the two friends, dreams of being a trainer at the gym where she cleans toilets. Ilana toils at a Groupon-esque knock-off that isn't so great at paying their employees, but considering that she spends most of her workday sleeping in a bathroom stall, it doesn't seem like a huge injustice. 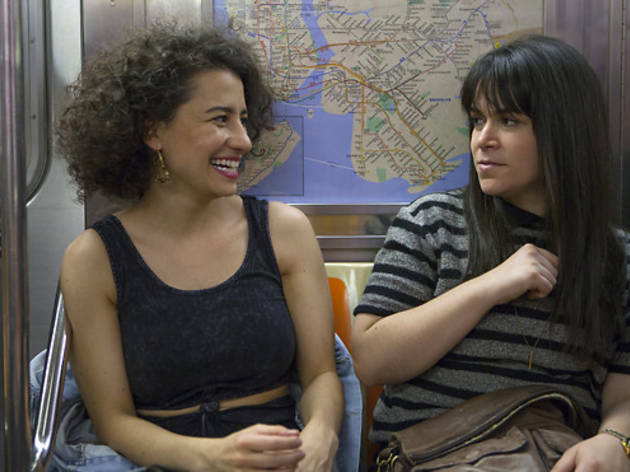 While it's structured like a sitcom, Broad City has the manic energy of a sketch show. Jacobson and Glazer are two very funny ladies that are willing to debase themselves in all manner of ways to get laughs. In addition to Poehler's involvement, several comedy heavyweights make guest appearances, including Hannibal Buress, Fred Armisen, Rachel Dratch and Janeane Garofalo. There's plenty of promise here, but the show still appears to be feeling its way about. This is especially evident when Abbi and Ilana's stories part, dividing the comedy into two very different tones. Ilana's stories tend towards the outlandish, relying heavily on awkward physical comedy, while Abbi's are more subtle and take more artistic liberties. A sequence that interprets Abbi's never-ending ride on public transportation as a series of horror tableaus is one of the series' early high points and signal that Jacobson and Glazer have some impressive tricks up their sleeves. With its unique voice and brand of humor, Broad City is an intriguing addition to Comedy Central's growing stable of original programming.